Survey of bins in the CBD found 11 per cent contained bank account details and legal documents. 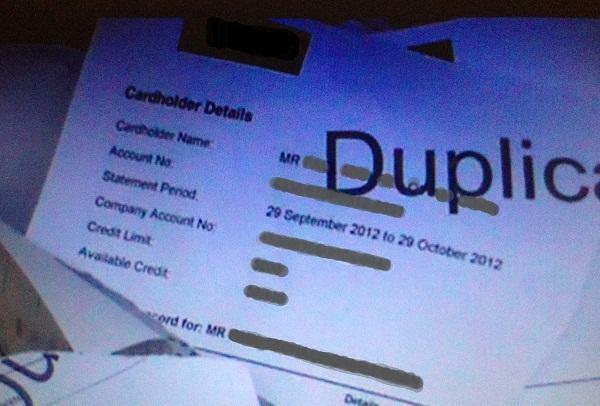 Documents showing a customer's cardholder account details and address were found in a rubbish bin used by a bank branch in Sydney. Some Sydney bank branches, lawyers' and doctors' offices have been found guilty of not properly disposing of personal information in rubbish bins which could be used by criminals for the purposes of fraud or identity theft following a private investigation. The investigation, which was conducted by the Private Group on behalf of the National Association for Information Destruction (NAID), took place during January and February 2013. It was designed to discover the percentage of confidential data that might be available at a cross-section of organisations including goverment departments, law firms and accountants. Over 100 businesses were surveyed by the private investigator with 11 per cent found to have personal confidential information located in bins outside their offices. According to NAID CEO Robert Johnson, bank branches fared badly with 40 per cent found to have thrown out financial data. For example, one document listed an account holder’s name, address, credit card number, account balances and credit limit. “A criminal could establish false credit or access the account holder’s funds with this information,” he said in a statement. Another set of documents found outside a solicitor’s office included correspondence about a legal settlement for a real estate dispute. It detailed the parties involved, amount of the settlement and bank account information for the account receiving the settlement. The investigator also found documents in a rubbish bin located near a law office which detailed a legal claim against an employer by a female employee. The claim was about a specific medical condition which she claimed resulted from a hostile workplace. “Not only does the release of this information compromise the lawyers’ professional responsibility to keep client information, it could have compromised the client’s claim and reputation,” Johnson said. In addition, results of blood tests from a laboratory were found outside a doctor’s office. On the forms were patients’ names, addresses, social security numbers, and diagnostic information. According to the NAID investigation, 25 per cent of doctors’ offices had confidential information in their bins as did three out of 16 law offices surveyed. However, some sectors reported good results. Of the nine randomly sampled rubbish bins serving government offices, no confidential information was found by the investigator. Accounting firms and financial planning organisations also scored well with none of the bins examined found to have confidential data. NAID also conducted similar rubbish bin investigations in Toronto, Madrid and London with Sydney faring better than these cities. According to NAID, more than 40 per cent of commercial rubbish bins in the three cities contained confidential information from banks, law firms and doctors' offices. “Though the Australian survey results were better than other similar studies, it would be a mistake to consider it acceptable,” Johnson said. According to the Australian Crime Commission (ACC), identity theft is the fastest growing crime in Australia. In 2010 and 2011, Australians lost more than $1.4 billion due to personal fraud crimes. “Studies have shown that these criminals often rely on low-tech, untraceable sources of personal information,” Johnson said.